Jerry Springer hosting 20 years of phony fights. 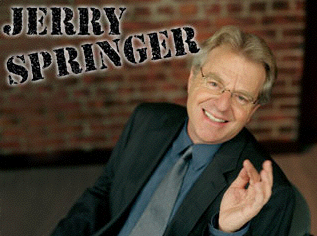 Several months ago, the "Jerry Springer Show" celebrated its 20th Anniversary on television. Not bad for a show that was signed to an initial six week contract and had a lot of uncertainty about its survival. But the strippers, hookers, cheaters, midgets and transvestites parading and slapping on stage help the 20 year "Jerry Springer Show" hoax continue. The "Jerry Spring Show" has made old Jerry a very rich man. He's a worldwide celebrity. That's what happens when you are the king of trash TV. In an interview, Springer said, "We had no idea if the show would work. No one had ever done anything like this. I wasn't interviewed for the show host position, I was told - You'll be doing this show, good luck." Twenty years later, Jerry, Jerry, Jerry is still being shouted by packed audiences goading the freaks on the stage to act worse than usual. Recently, I checked out a few episodes of "Springer" to see if much has changed in twenty years. Nope. Oh... my mistake... more tattoos. That's about it. The same trailer trash, mutant inbreeds, strippers, gay midgets, sordid sibling lovers, strippers, sideshow freaks, low-IQ hillbillies, strippers, transvestite fatties, ex-felons, mentally deficient fast food workers, strippers and venereal diseased hookers are keeping the show running like clockwork. Oh, did I mention strippers? Something never seemed right with the "Jerry Springer Show". It was too much of the same, regardless of the degenerate nature of the participants. On EVERY show, there is a fight. As new guests are brought into controversial situations, they immediately kick off their shoes - a sign they know a fight is coming. I honestly believe they pay the guests extra to fight. "No matter what happens, fight." The "fights," however, have a certain scripted quality to them. All of the combatants slap each other. There is also a fair amount of hair pulling and invariably a wig or two hits the deck. Shirts get ripped off the guys with regularity. I saw one show where you knew the shirt had to have Velcro seams. Shirts don't rip off that easy, I've tried it. Buttons pop off easily. But to yank a sleeve off of a shirt takes some effort. In all the "fights," which happen EVERY show - no blood has ever been spilled. No one has ever been knocked out. Guests hit the deck from slips, twisted ankles and poor balance - never has anyone been clocked and crashed to the floor. In the UFC era, I think Jerry needs to amp up his show. Guests should appear in an Octagon. They should be allowed to really get their frustrations out and tear each other apart. Who wouldn't thrill at seeing two gay lovers smack the living crap out of each other. Make it a death match. This would thin the herd of idiots and reduce the number of people in our population who shouldn't breed. After the fight, survivors would be shipped to a big zoo or back to prison. Harmless zoo animals are stuck in cages for their whole lives and they never did anything wrong. Springer guest are routinely released into the wild. I don't agree with this "catch and release" philosophy of the show. Springer is doing a good job of collecting the garbage, but then he dumps the Hefty bags of heathens right back out on the curb. Maybe we can do the environmentally correct thing and recycle these people as store mannequins. We dip them in a hardening agent and then ship them to department stores all over the country. Hey, I'm thinking, are you? OK... this idea is a bit sick, but I think it would be a win-win situation for everyone. Ship the Springer guests to cannibalistic societies in the far reaches of the earth. This could be considered humanitarian aid. Why have the cannibals eat their own, when they can feast on the dregs of America? Some of the Springer guests are pretty big and they would be like a fat Christmas ham to the cannibals. All I know is, I want Springer to raise the bar on indecency and human stench. Bring it to a new level. He'll be on TV for another 50 years, if he does. But for now the freaks help the 20 year "Jerry Springer Show" hoax continue. A 20th anniversary is a big deal. We might even get to see him with his wheelchair on stage during his 50th Anniversary. Hey you never know! I love Jerry Springer! Springer is one of those shows that you don't want to admit you watch. I rarely see it. But I did see enough of it to write this article.